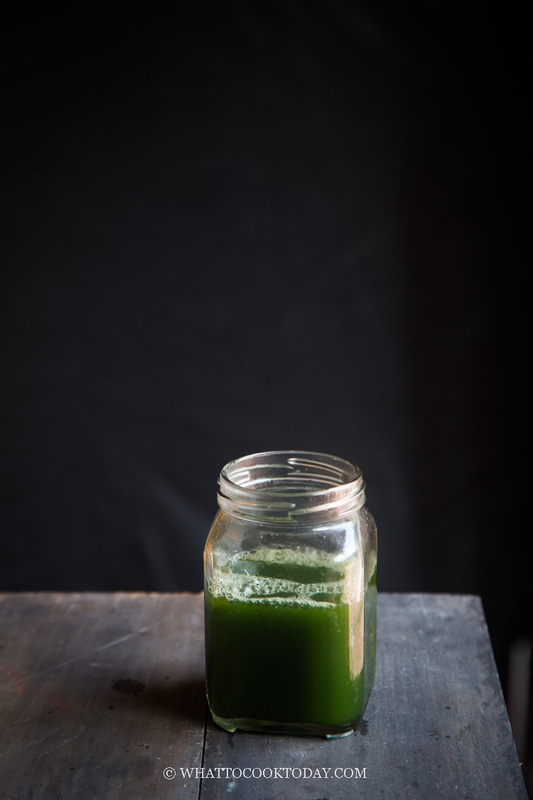 Learn how to easily make pandan juice and pandan extract with fresh or frozen pandan leaves. It is so much better than artificial pandan extract. 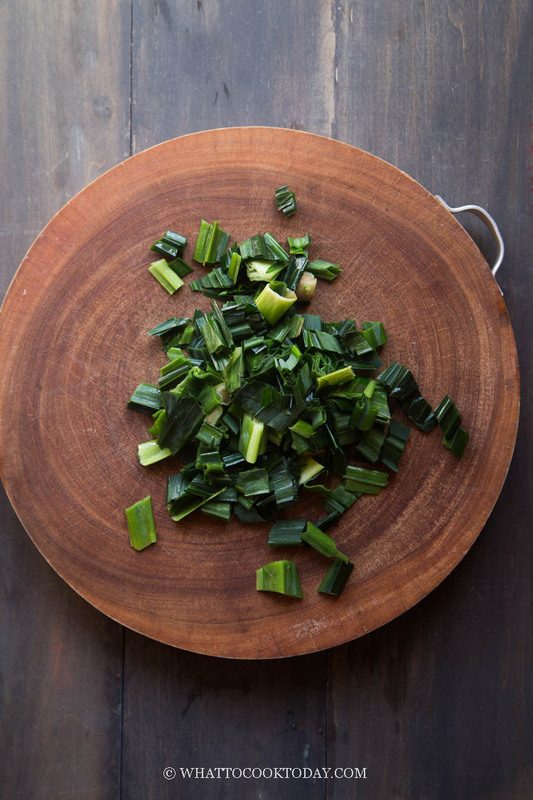 Pandan is one of the quintessential ingredients in Southeast Asian and South Asian cooking. 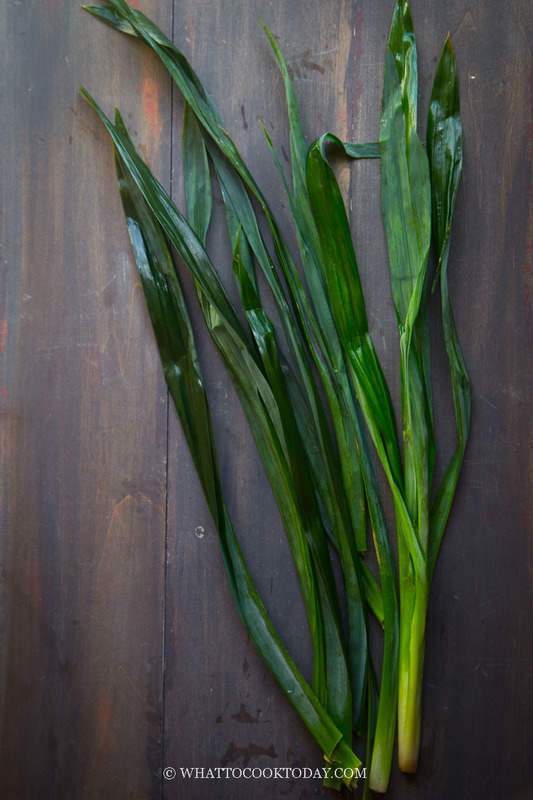 Both pandan leaves and their juices/extract are used a lot in both savory and sweet dishes. Pandan leaf is also known as screwpine leaf. It has an amazing aroma that I’m not sure how to describe. It’s pleasant, sweet, and mild at the same time. I think I’ve mentioned before in my other post that my late dad used to place whole bunch of fresh pandan leaves in the car as an air freshner. Smelled amazing (and makes me hungry thinking of all the food flavored with pandan leaves lol). Unfortunately, I had no luck growing my own pandan leaves, not here in Minnesota where winter is so brutal. My mom had pandan leaves growing out of her ears back in Indonesia! ENVY!!! These pandan leaves shown in the photos were actually sent by one of my readers from Texas. They were homegrown. Lucky me! Sometimes I could find fresh pandan leaves at Asian grocery stores, but not always. Most of the time, they come in frozen, which is fine too. Pandan juice is basically what you get when you blend the leaves with water. 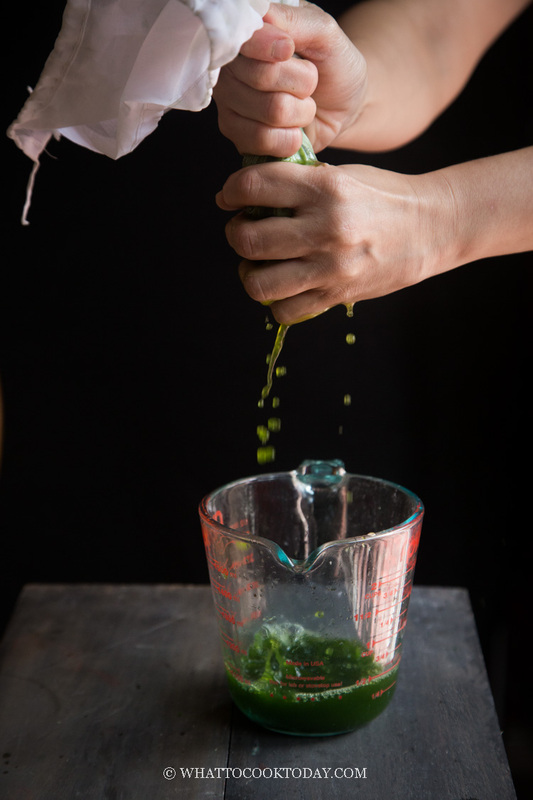 Pandan extract is the sediment that accumulates at the bottom of the jar of pandan juice after you leave it for 18-20 hours. 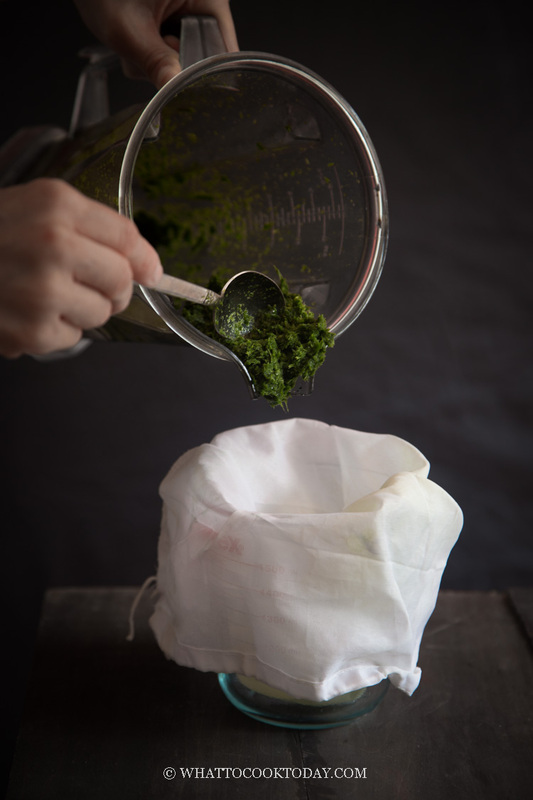 The sediment is basically the pigment, chlorophyll, that gives pandan its green color. The water on the top layer is discarded and the sediment is your pandan extract. 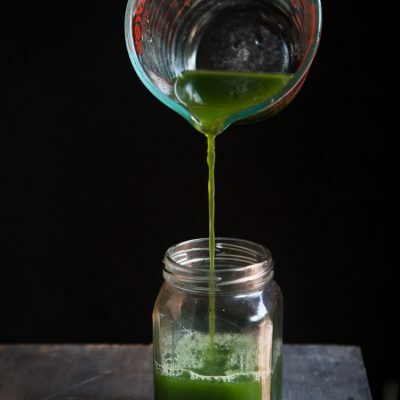 The steps for making pandan extract are the same with pandan juice. For pandan extract the additional step is you need to leave the pandan juice in the refrigerator for about 18-20 hours. 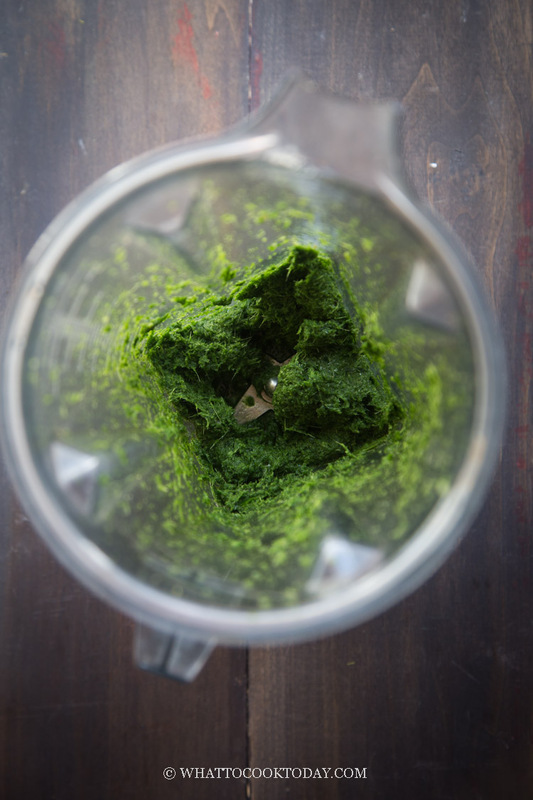 The green sediment will sink to the bottom of the jar. You discard the water and the sediment is pretty much your extract. Easy peasy! They need to be stored in the refrigerator and can be kept for up to 7 days. After that they will start to smell rotten. I do not recommend freezing pandan juice and its extract because the flavor gets weak and they tend to separate. 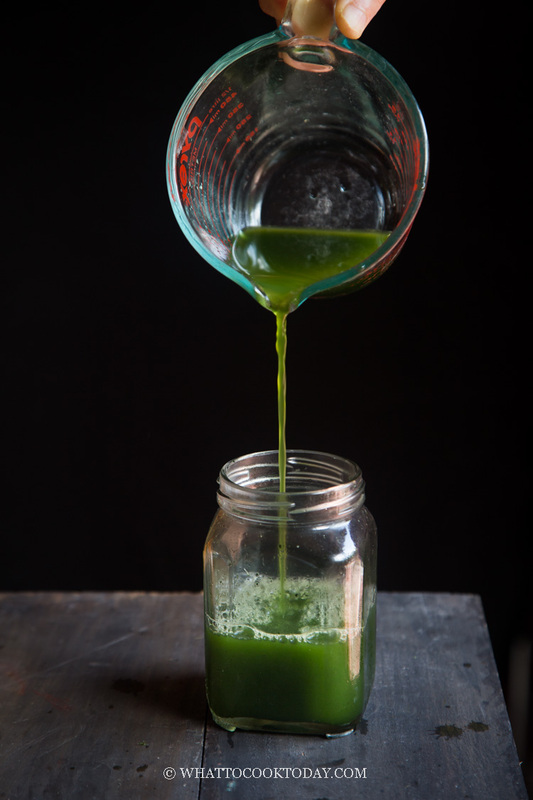 What’s your favorite recipe(s) using pandan juice or extract?